Bunker shots and golfers don’t seem to go together too well but bunker shots should be the easiest of any golf shot. 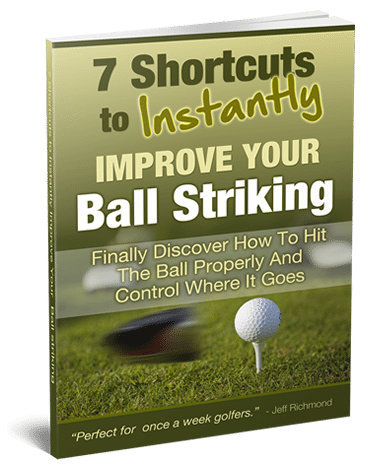 Simply because it’s the only shot in golf that you don’t have to hit the golf ball! But most golfers that suffer from bad bunker shots do so because they have way too much lower body action when playing bunker shots. The more moving parts you have when playing bunker shots the more inconsistent and worse your shots will be. So in this article I’m going to give you a great, simple bunker shot drill you can do to make your bunkers shots simpler and more repeatable. First, to do this bunker shot drill go a practice bunker and place at least 20 balls in the bunker. Then get one ball and setup to a bunker shot as normal. Before you start your backswing I want you to make sure 70% of your weight is on your left side and then raise your right heel off the ground by a couple of inches. By setting up like this it will put most of your weight on the balls of your feet and most of the weight will be on your left side. From this “new” bunker shot setup position then you simply have to swing BUT make sure when you do this that your right heel remains in the same position (i.e. off the ground) all throughout the backswing and downswing. You can let it come up off the ground even more on the follow-through though. By swinging like this it will help you to keep your weight on your left side all throughout the backswing and downswing PLUS it will help you to keep your leg’s quiet in the swing which will make the swing simpler and help you to hit better bunker shots. Do this drill for the rest of your 20 balls and then hit a bunker shot with your right heel on the ground and feel the difference. After doing this drill you may even like to keep the right heel up off the ground for your normal bunker shots. Whatever works best for you then do it. Just remember, when playing bunker shots to try and keep your lower body very still and quiet. 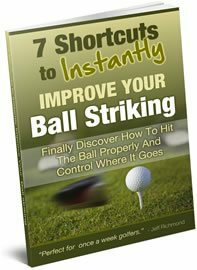 This will help you to hit more consistent and better bunker shots.